Fourteen of the best young minds from the University of Kwazulu-Natal’s Master of Laws (LLM) programme have put their qualifications to excellent use at LexisNexis South Africa, where they fine-tune some of the pioneering legal research tools on offer from this global company. Louis Podbielski, Case Law Manager at LexisNexis South Africa, is overseeing the project alongside advocate Christopher Rodel, who has lectured at UKZN, and supervises and mentors the LexisNexis student team. “In legal practice, time is money, so fast and accurate legal research is pivotal to success. Not only are these students developing their own skills in this area, but they are also helping to perfect innovative solutions that aim to simplify legal research for the wider legal fraternity,” said Podbielski. LexisNexis’ bank of case law dates back to 1828 and one of its leading research solutions, Legal Citator, offers a neural network of over 90,000 cases including positive sentiments or criticisms of findings. The students perform the mapping and LexisNexis runs a complex algorithm to quickly show how a case has been treated in subsequent judgments and whether it is still ‘good’. There is also a stringent quality control process in place. The graduates, most of whom completed their LLBs in 2017, have said the experience at LexisNexis has been invaluable and has provided them with hard to come by exposure to varied case law ranging from Criminal Law to Tax and other areas. LexisNexis ran a two-week Legal Citator training programme as well as teambuilding exercises and workshops to help groom the students for success. Chante Botha, 23, of Glenwood, was one of the first two graduates to commence work with LexisNexis on the project. She matriculated from Durban Girls High before completing her LLB at UKZN. “LexisNexis offers tools that are innovative and allow legal practitioners access to extra information that can provide value to them in their practice and legal research. Being involved in this process has been so rewarding for my own early career development,” she said. Lungelo Mkhize, 23, of Mariannridge, matriculated from St Francis College and completed his LLB at UKZN in 2017. He is juggling work on his LLM with work at LexisNexis, which he originally joined through a six-week vacation programme. He aspires to work in-house for a corporate entity in the future. “Our profession is all about reading but nobody really wants to read through reams of case law without direction. LexisNexis’ solutions are about simplifying this process and pointing you towards the relevant case law,” he said. Mkhize lamented the fact that the focus during tertiary study of law was often on theory, with many students graduating with an LLB but without a solid knowledge of how to apply the law in practice or with the ability to conduct legal research efficiently. Lungelo Gwala, 23, of Clermont, who graduated from Reservoir Hills Secondary, agreed. “Our profession is practice-based and I believe that universities should focus more on practical application, for example how to draft contracts,” he said. “I found it quite problematic that we only get to participate in Moot Court in our fourth year of studies,” he added. He said the experience at LexisNexis was helping him to sharpen his own legal research skills and critical thought processes, which would be an asset as he, too, sought out in-house counsel opportunities in the future. “We always heard about LexisNexis on campus, so getting to work here was an amazing opportunity,” added Sheona Naidoo, 24, of Umkomaas, She commenced work at LexisNexis in April 2018 after completing her LLB in 2017 and had worked on Legal Citator’s Tax content, as well as on Compliance and National Legislation. 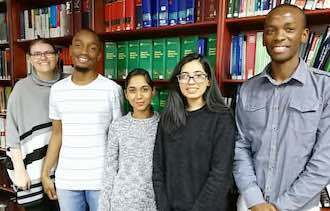 Above: Some of the Master of Laws (LLM) students who have put their qualifications to excellent use at LexisNexis South Africa included, from left to right, Chante Botha of Glenwood, Lungelo Mkhize of of Mariannridge, Taryn Jayassellan of Chatsworth, Sheona Naidoo of Umkomaas and Lungelo Gwala of Clermont.